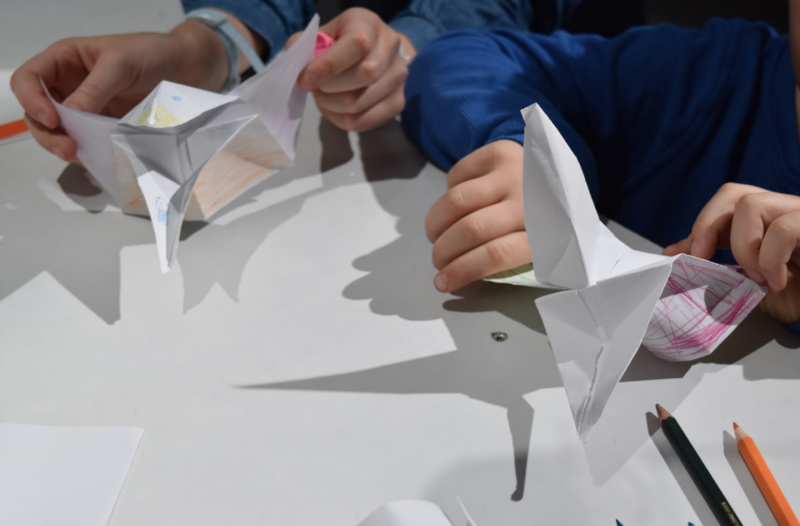 Reflections on the value of running Aerocene workshops with children. So much inspiration. So much excitement. So much was felt amongst our youngest of Aeronauts. Children. Give them some materials, some space in and they will create their own worlds to completely immerse themselves within in no time. They take what you give them and use it as material to weave brilliant worlds of imagination. We speak a lot of the value of childhood imagination in the creative field, but how does this abstract value translate in graspable real-life terms? In the context of the Aerocene workshops in Palais de Tokyo, I gave newborn Aerocene enthusiasts spheres, lenses, sticks and tape; they created floating cities, silver dragon parachutes, hand-held solar concentrators, all taken out of our most innocent and colourful dreams. It is easy to accept how lovely such exercises are but can we dig deeper into talking of the value of it? The point of departure for this conversation is that imagination doesn’t stay confined only within the realms of the intangible and inexistent. Imagination is a form of future creation. Growing up, we get exposed to information, ideas and possibilities. Later in our lives this early information we get exposed to turns into usable knowledge answering to our everyday problems; imagination reconfigured into real-world answers. Nourishing this collection of information early can give rise to new possibilities in the future. What we dream of today lays the grounds for how we problem solve in the future. These are the building blocks for the world of the future. Being aware of this can be one of the most seminal points in conversing about the environment and finding creative ways to sustain it. With this in mind, I look positively into a future when our young Aeronauts become engineers, architects, and thinkers. When I was maybe 10 years old, my father gifted me an origami book he found during his travels in Japan. I got immersed in it, trying out all the different creations I had the time and patience exploring. Among them was a model for a paper bird that opened and closed its beak as a geometrical response to the opening and closing of its wings. 11 years later I met Daniel and the Aerocene team during an Aerocene Hack in London. They presented me an interesting fact and a thought provoking challenge. Fact: Balloons expand as they go upwards. Challenge: Create a trap that tests for life at 10 km height. All came together; the origami got on the balloon and it became a trap to test life in the air. Simple. Uncomplicated. Elemental. Of course not all experiences are as linear as this but the value remains the same; the information we learn while growing to become adults reconfigure into answers to problems we are faced with later in our lives. If the information we find valuable to collect is mechanically inclined, it is only natural that the answers we come up with are going to mirror that. What materials do we pass on to our next generation? And perhaps more importantly, how can these materials define the world of tomorrow? How different is tomorrow going to look like if we pointed the kids to look at the sun as a source of energy instead of fossil fuels? What if we gave children an aerosolar sculpture instead of a toy car or plane? What if we raised them with stories of floating with the wind instead of stories of violent conquering? At a critical time for our planet like this, we can imagine very easily how teachings we pass on to the next generation can become a make-it-or-break-it-deal for the future of our planet. The responsibility is huge but so is the potential. Think about this. Parents! What if you borrowed an Aerosolar Sculpture from Aerocene Foundation and head outdoors? Reattune yourselves and your children to the environment. Teach each other. Show your kids how bodies can be lifted so simply; all it takes is some air and heat coming from the sun. Sow your children’s thinking toolboxes with seeds of mechanical, fossil-fuels-free principles and let us see together how these seeds can sprout into the future.